PARIS 17 JANUARY. SORGHUM IN HUMAN FOOD. This was the conclusion of the meeting organised by FNPSMS (Sorghum ID) and Céréales Vallée, on the topic of human food. Thirty participants from French, Italian, Belgian and Dutch seed companies, stocking organisations and industrial processors were there. After a presentation of the French varieties catalogue and the market opportunities for sorghum, the human food potential was highlighted. There is a lot of potential to tap, as sorghum can benefit of certain trends: the boom of gluten-free foods and the interest of consumers from new cereals (niche markets). The uses of sorghum in human food are diverse: flour, pop sorghum, bread, tortilla, alcohol (Baiju, Chinese alcohol and beer). But we have to raise awareness on them! New initiatives, such as sorghum pasta produced in Italy by Nutracentis.com have concretised. More should follow, with the support of the value chain. BAZIEGE 21 JANUARY. SORGHUM FIGURES 2018. The annual meeting of the sorghum value chain was organised on 21 January in Baziège, the heart of the French sorghum production, at the initiative of Arvalis Institut du vegetal. Around 50 people (farmers, technicians, seed companies and plant protection companies) were present. The objective was to discuss the figures of the 2018 crop year. Yannick Carel presented the global figures: slow decrease of production (under the 60 MT threshold), slowdown of global trade (consequence of the US-China trade war), growth of consumption (with the lowest global stocks of the past 5 years). Jean-Luc Verdier presented the French figures: increasing acreage (more than 61,000 ha), evolving production areas (decrease in the tradition production areas of Occitanie, but increase in Nouvelle Aquitaine and the Centre region where acreage doubled), stable yield (56qx/ha on average like in 2017), with certain heterogeneity between regions (some regions going over 80 qx on average, while some others had to deal locally with heliotis). The day ended with a presentation of Sorghum ID and its promotion actions at the European and French level. BUDAPEST 23-26 JANUARY. AGROMASHEXPO EXHIBITION. 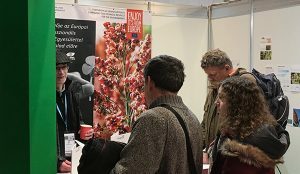 Many producers came to the Sorghum ID stand in the Agromashexpo exhibition to discover this crop, still little known in Hungary. Many were convinced that sorghum has a future in their country, given that climate change threatens spring crops. In this situation, sorghum is a very useful alternative. But uses must be developed, and education efforts must be done to fight against false perceptions. Indeed, there are still many professionals who do not know that thanks to the efforts of seed breeders, European sorghum has been tannin-free since 30 years. This is true for all colours of sorghum. Despite all this, the crop is developing in Hungary: in 2018, acreage more than doubled, going from 5,000 ha in 2017 to 11,000 in 2018. Some integrator-collectors such as KITE, very present in Hungary, have begun to collect sorghum to use it notably in poultry feed. Sorghum ID was present in the Moscow MVC exhibitions : Cereals-Mixed Feed – Veterinary, which is a professional exhibition created in 1996. Several seminars were organised in this framework. One of them dealt with “Feeding and breeding poultry”. 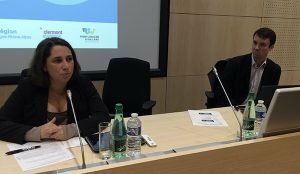 The programme was introduced by the Director of the Russian poultry union, Ms Bobyleva: “the production of poultry is increasing”, she explained, “but we are still far from the volumes produced in the 1980s.” The objective is to export poultry to Europe and Asia which will respect sanitary rules. Another objective: envisage new markets, such as organic agriculture. 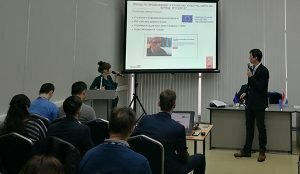 Several Russian and European experts intervened, notably on poultry production with limited doses of antibiotics, and the use of dietary complements. Around 50 people – producers, feed producers, journalists – were there for the intervention of Sorghum ID. After having presented Sorghum ID, its objectives and ambitions, the assets of sorghum in poultry feed were developed on the basis of experimental data. A focus was also done to remind the audience that the EU varieties are tannin-free. There were many questions, especially on the incorporation rates of sorghum in formulations.